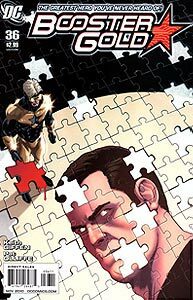 Cover Description: Booster Gold stands holding a bloody puzzle piece over an over-sized jigsaw puzzle of Max Lord. Brief Synopsis: Trying to save Blue Beetle, Booster Gold finds himself at the dawn of an interplanetary war. 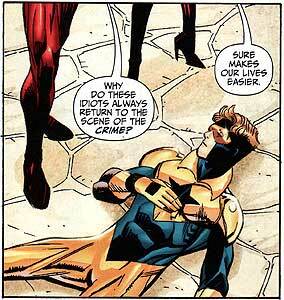 Booster Gold learned this lesson in Booster Gold, Volume 1, #7 with the help of Skeets and Superman. For a second time, Booster is confronted by Darkstar Phil and his still unnamed partner. Continuing his Walt Disney-themed hijinks, Beetle sings "When You Wish Upon a Star," a song from Disney's 1940 Pinocchio. While the Darkstars may not care for it, the Academy of Motion Pictures Arts and Sciences sure did, granting it an Academy Award for "Best Original Song." Disney would later chose the song as the theme for a television show. Starlag Containment Craft is a space-station prison run by the Citadel race in the Vega system of the DC Universe. The name of the prison is a pun on the German prisoner-of-war camps of World War II know as "stalags." If this is where Booster Gold and Blue Beetle have been incarcerated, Queen Artemis' planet is likely in the Vega system as well. POWER DOWN: Booster explains that the Darkstars were able to turn off his powersuit through the user of a "neutralizing patch." It seems that if such a thing were effective, his time- and space-traveling foes the Time Stealers would acquire a patch for their use. ...and alien Dominators, both of whom he has encountered multiple times before. Skeets debuted 25 years ago in Booster Gold, Volume 1, #1 in 1985. This panel includes its first 1st-person narration box! In fact, the page is full of them! (Skeets' first entire page of narration!) Hurray, Skeets, for finally being recognized as a thinking character and not just a simple automaton sidekick. Though Booster battled the Alien Alliance in Invasion!, this is the first time that he has shared a panel with the Warlords of Okaara. L.E.G.I.O.N., or the Licensed Extragovernmental Interstellar Operatives Network, was formed following Vril Dox's first modern appearance in 1988's Invasion! mini-series. L.E.G.I.O.N. has occasionally crossed passed with Booster Gold and the Justice League. For someone who is intimidated around "really smart people," Booster has spent a lot of time around them in this issue. Vril Dox, Mister Miracle, Blue Beetle, and Rip Hunter would all be considered "really smart people" in the DC or any other universe. How, exactly, does a flying robot become nauseated? Skeets has no stomach to be sick to, and it is unlikely that it would be offended by laundry or soap. FIRST APPEARANCE: First appearance of Estrogina. Boosterrific Review: Whew! This issue is all over the place! Fans of Giffen's and DeMatteis' trademark humor will find something to love in this issue. So will fans of DC history. And Blue Beetle fans. And Justice League International fans. And space opera fans. And, well, probably just about everybody. The book's only significant flaw is that the art of Pat Olliffe (pulling double-duty on pencils and ink) is very uneven, probably a side-effect of the book's breakneck plot and diverse plot elements. Vintage Bwahaha humor from Giffen & DeMatteis! Love it!!! Awkward and uncomfortable. This story should have wrapped up last issue and we should have moved on from the nostalgia trip. I was not amused by "chipmonk" BB and it seemed the story hinged on finding that one element funny. I was enjoying the previous issues of this story, it just fell off the wagon in this issue. What a waste of a great cover. It's all over the place, indeed. I'm inclined to give this issue 1 star, but I'll add a star anyway for my expectations. Giffen and DeMatteis better end this arc with something substantial. While there were some fun moments, the book seemed a bit off, especially with Booster facing much darker plots in other comics right now. The art was a bit off.